Figure 1. Graham’s compartmental model for input function is a catenary model, in contrast to PK three-compartment model. VP is the volume fraction of plasma, VIF is the volume fraction of interstitial fluid, and VTF the volume fraction of tissue fluid. PS1 and PS2 are permeability-surface area products for exchange between VP and VIF, and between VIF and VTF, respectively. GFR is glomerular filtration rate, representing elimination rate of radiopharmaceutical from the circulation. Figure 2. Example inputs for Graham’s CM plasma model. 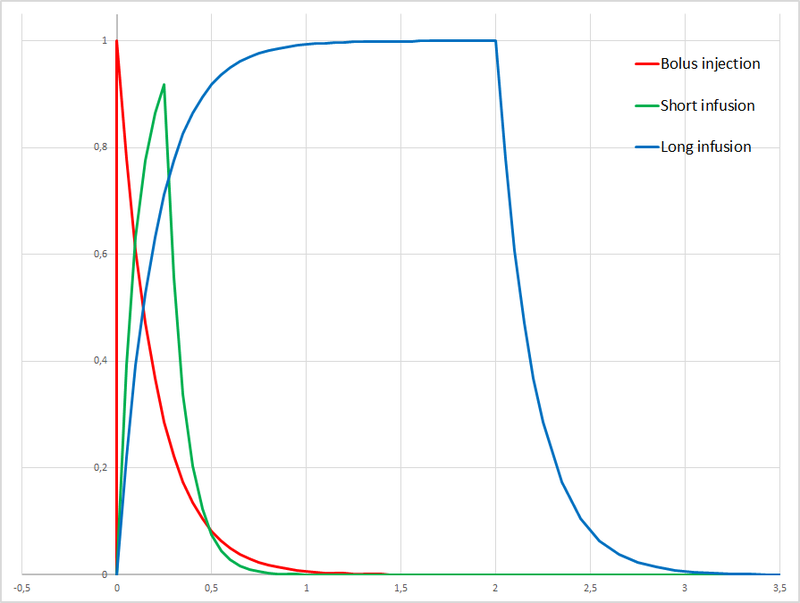 Bolus injection (red) is simulated with parameters H=1 and ki=5 min-1. Short infusion (green) is simulated with H=1, ki=10 min-1, and duration of infusion Tdur=0.25 min (15 s). 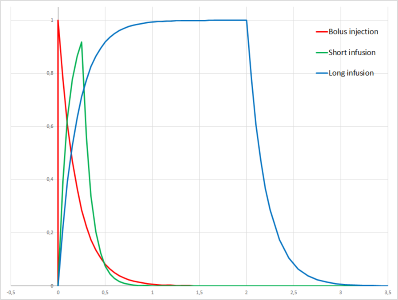 Long infusion (blue) is simulated with H=1, ki=5 min-1, and Tdur=2 min. To use traditional boxcar (rectangular) function, set ki=0. The Graham’s model depicts slowly varying plasma activity over several minutes, but is not intended to model the first-pass kinetics and recirculation effects with radiotracers such as [15O]H2O. As Graham points out, all compartmental models will have a simple exponential behaviour at late times, although many radiopharmaceuticals tend to have a slight upward convexity long times after injection. This model cannot account for this phenomenon, nor the appearance of label-carrying metabolites in the blood or plasma. Compartmental model for metabolite correction was developed by Huang et al. (1991), and Graham (1997) suggested combining the compartmental models for plasma curve and metabolites. Graham et al (2000) used his compartmental model for smoothing and interpolating TACs from aorta in a FDG study to construct a population-based input function. Spence et al (2008) used the method to extrapolate metabolite-corrected blood TAC in a [18F]FLT study. In a slightly expanded version of the Graham’s compartmental model the blood (or plasma) compartment is separated into two compartments, arterial (BA) and venous (BV) (Figure 3). This adds dispersion that happens in the pulmonary circulation to the modelled arterial blood curve. Radiotracer is administered to the venous compartment, which accounts for the initial dispersion of bolus infusion, and therefore the infusion can be simulated using simple rectangular (boxcar) function. Tissue compartments are in parallel, not in series; kinetically the parallel model is indistinguishable from the model with compartments in series, but differential equations for the parallel model are simpler. Figure 3. Modification of Graham’s compartmental model for input function has the body tissue compartments (TF as fast and TS as slow) in parallel. Additional venous blood compartment (BV) accounts for the dispersion in pulmonary circulation, before blood reaches systemic circulation as arterial blood (BA). Figure 4. Metabolism rate constants (kMs) added to the modified Graham’s compartmental model (Figure 3) for input function. Rate constants for parent radiopharmaceutical are as before, but denoted as kPs. Depending on the radiopharmaceutical, one or more of the kMs could be assumed to be zero. Although the model is shown like the metabolites from in the tissue compartments or in the venous and pulmonary system would return to the BV compartment, this model only accounts for the disappearance of the parent radiopharmaceutical via metabolism, but does not actually consider the fate of the labelled metabolite. However, the metabolites formed in this model setting could be used as input for compartmental models describing the plasma kinetics of the metabolites.